Can you make money with Binary Options? The direct answer would be YES. People are able to make money online with the help of binary options trading if you know where to find legitimate binary options trading websites and have the proper trading strategy behind each trade. Binary trading is very much alike with Forex and Stock trading. Is trading binary options safe? There are scam websites that trigger people to ask this question. As we all know, scam websites aren’t that new to people that are into online trading as they exist and take a whole lot of internet space. In other words, yes they exist and there are a lot of them! Trading binary options are risky due to this fact. In general, trading is safe, as long as a legit website is used to trade them. How do you trade binary options? When people get interested in binary options, the next question that naturally would go through their heads would be how to trade it. To trade binary options, you need to find websites that you can trust. Websites such as Coinut.com that offers such feature and has been operating since 2013 and no history of major issues with their website, which is good! Today, we will be looking into what Coinut.com has when it comes to Binary Options trading along with their website features, company information, and many more with of course, how to trade binary options with them. Without further delay, let’s talk about that! Before we look into the website head on, we need to read more about them to get a complete understanding of what this company is all about. As mentioned above, the website has been operating since 2013 and has no major reports about the company’s performance or hacking problems in the past four years. The company was founded by Xinxi Wang and is based in Singapore. The company Coinut Pte. Ltd. is registered in Singapore with their Unique Entity Number 201332271K which you are able to use through Singapore’s UEN website. Their physical office address is at 10, Anson Rd, #26-04, International Plaza, Singapore (079903). In addition, US users are welcomed here at Coinut.com, which is great! The first step is that we would want you to head on to their website and create an account with them. Click on the get started button or you can click on the “Sign Up” one located on the upper right-hand side of the page, both will have the same results. Once on the registration page, they will ask you to provide the username for the new account, an active email and password to go with your account. Once this has been provided, the next step would be to provide your mobile number to get the SMS code. We advise providing a real number here since an account cannot be created without this phone verification. Choose your current location and provide the phone number, enter the Captcha code and you’re good to go. After this, you will only need to go through a couple of clicks and you would be automatically logged into your new account. If the auto log-in feature does not activate, just enter your login details and everything should be fine. On the provided screenshot above we are able to see all the important details of their trading platform. Seen on the left-hand side of the screenshot is the main panel where everything that has something to do with a trade will is shown. Here you as a user will be able to change the market and currencies from USDT, BTC, or LTC. Below that is the Buy and Sell tab for the cryptocurrency that you want to purchase or sell. Next to that is the balance status wherein everything from BTC, LTC, ETH, ETC, USDT, USD is shown. The minute we were logged in, we looked into their trading platform for the feature that we are reviewing this website for, their Binary Options trading. Sadly, we had no idea where to find it. Shown in the screenshot above is their website Coinut.com showing the Binary Options trading tab but this cannot be located anywhere on their website. We have already sent them an email regarding this issue but haven’t got any replies yet. If you guys know anything about this issue please do let us know in the comment section below. 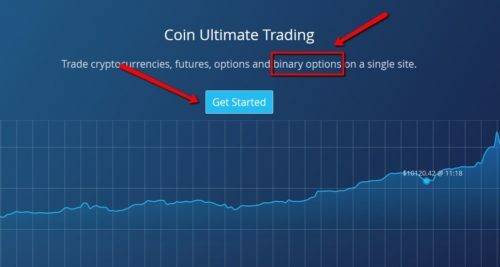 With that being said, we are unable to show any screenshots of the actual binary options trading here at Coinut.com but we are of course, able to give you an idea of how it generally works. 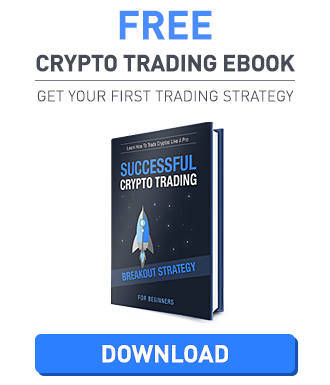 Generally, a binary option is where you pick two possible outcomes, it’s either the price goes up for a certain cryptocurrency or not. For example, you pay 0.004 LTC to buy BTC and use a binary option that has a strike price of equal to let’s say 400 and will expire 7 days later after you placed the order. After seven days and the price of BTC is above 400, then you get to win the bet. There are many variations on how a binary option is being traded but this is the general thought of it. Their trading platform, in general, is great. You do not get that much clatter on the platform as one. This creates more “movement space” and you do not feel restricted while you are trying to do something. It’s just disappointing to know that the binary options platform isn’t there for us to try it out. Knowing a website feature is as important as knowing if they pay or not. 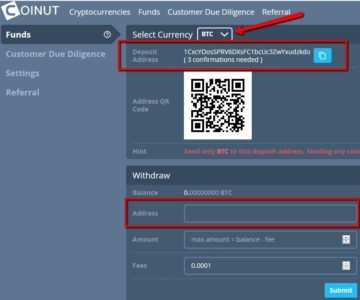 Here at Coinut.com, they have a couple of really useful features that one needs to know more about. Below are these features that you might have missed out. Two Factor Authentication – Not all websites have this ability today, which we honestly think is not acceptable. Good thing that Coinut.com has the feature to let their registered customers use the 2FA feature in their accounts to add a layer of security. You can access this feature by logging into your account and by clicking on the settings tab. Forum Interaction – We all know that reputations of online trading websites can be either made or broken through forum discussions. 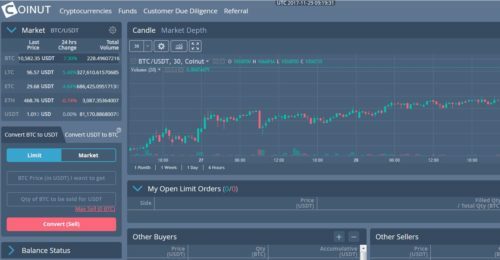 Aside from respectable third-party forums, Coinut.com has exerted extra effort in proving the most basic needs of online traders, a forum. Here registered users are able to talk about the latest gossip, issue, tips, and a lot more that involves the website itself. Referral – Last but not the least would be their referral feature. What’s great about this is that for each successful referral, they will pay you 0.002 LTC and the referred person 0.002 LTC which is a win-win situation. Not only that! You will get a commission fee of 10% during the first two years from your referred customer’s trading. To read more about it, click this link. We’ve come to the point of the review where we need to know how to get our money in and out of the website. To access the deposit/withdraw tab all you need to do is head on to your account page and click on Funds located on the upper part of the account screen. Once on the fund’s page, you will be able to see the deposit address, provided QR code, and the withdraw information needed. It’s pretty simple and straightforward that you wouldn’t have a problem depositing money or withdrawing it from your account. Coinut.com has a couple of customer service channels that you are able to use if you need any support. 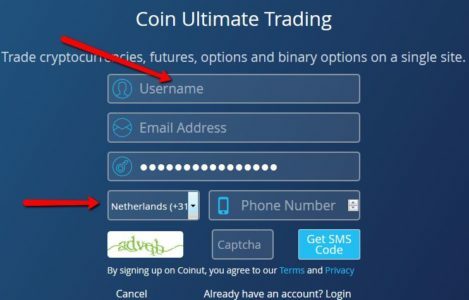 They have email support which people are able to reach through support@coinut.com or visit their website and scroll down for the email template. They also have an active live chat system that a registered customer can use and access through their account; the downside is that there is no dedicated live chat service for customer service. Overall, the website is great because you do not need to go through uncomfortable instances wherein you find yourself in a not responding tab or whatnot. The overall design of Coinut.com is great since the tabs are properly placed where you need them. The only problem is that their Binary Options trading tab is nowhere to be found! As mentioned earlier, please do let us know if you guys have any updates regarding this issue. Overall, a not so fun review since we were not able to look into their binary options tab!